Looking for a Magician in Winnipeg? Looking for a Winnipeg Magician? Hello and welcome to the magical world of Mr. Ken. Every season should be magical! And it is easier to believe when you hear children shout during a show: “That is real magic!” and “I want you to come to my birthday party” and “I wish you were my father” (These are actual statements shouted during Mr. Ken’s magic shows and the last one was not a cheesy starwars pun. As a parent, you love seeing the joy in your children’s eyes as the magic unfolds. Suddenly the mind of every age stop thinking of the daily routine as it enters the enchanted world of the magician, who’s sleight of hands create little miracles, turning reality into something unreal and fun. As an event organizer, you want your guests to be in good hands, have the time of their lives and thank you for making the show happen. Our goal is it to make you look good for deciding to hire Mr. Ken, a magician in Winnipeg. Mr. Ken has performed at children’s parties and family shows in Paraguay, Germany, Mexico, Canada and USA in four different languages (German, Spanish, English and Plautdietsch). Mr. Ken works to make your guests feel good. Laughter and wonder are inevitable. It’s all about “moments that create fond memories”. Is Mr. Ken the best magician in Winnipeg? Experience under any situation and with different cultures means you have a seasoned entertainer. Let’s face it, no matter how many times we have experienced the magic, it never ceases to amuse all of us and not just our children. It never becomes boring either, as magician Mr. Ken always has new tricks up his sleeve (p.s. not necessarily meant to be taken literally). There is no better way to spice up a party or event of any type, than with the magic of wonder, music, laughter and surprise. Why not have a look around our site, watch our magical videos, give us a call or write an email. Surely you have something to celebrate soon, we would love to help you make it a magical experience, again! 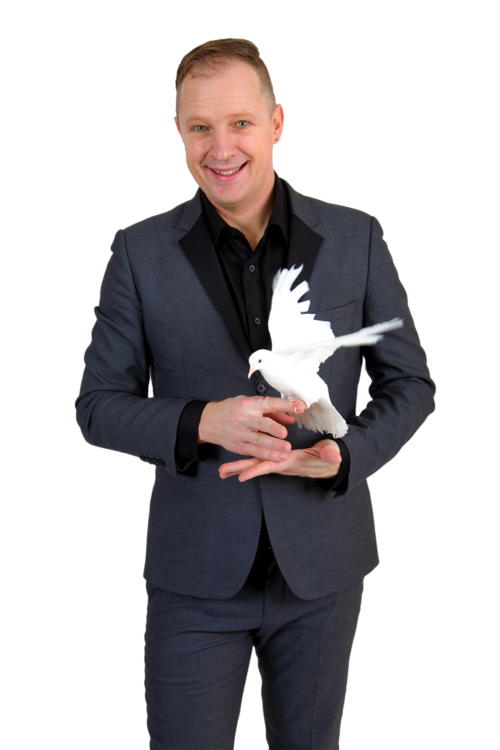 Magician & Mind Twister Mr. Ken takes mind-boggling magic and blends it with music and wholesome, family-friendly comedy to create a high-energy, highly theatrical show. Mr. Ken will leave your whole family astonished, captivated, laughing out loud and absolutely – Entertained! Audience participation is masterfully integrated into the show that volunteers, who are always treated with respect, can have their moment to shine on stage without being embarrassed. Winner of the Winnipeg Parent’s Choice Awards. Booking a Winnipeg Magician should be risk-free and fun!